Away from the city, with Birmingham way back in the rearview, we entered a patchwork of small farms and wood plots. After that, it was pine forests, with here and there a mailbox and a gravel lane behind it. It was winter in eastern Alabama, a time for waiting for signs of spring, of being ready to plant. Soon we passed sections where fires had been set in the undergrowth, controlled burns that cast an otherworld orangey glow to the evening light that filtered through the pine needles. I knew of this land from the talk I’d heard from older relatives. There were precious few deer in the 1940s and ’50s in Alabama. A deer track spotted on a creek bar would set locals speculating down at the crossroads store over the pickle barrel. Instead, folks around here grew up hunting squirrels, possums, raccoons and bobwhite quail — and tending the land. Soon came into view, the mailbox and the gravel drive for which we had looked. We drove down a quiet lane in the smoky air. Then pushed open an oaken door. We stepped into a quiet living room. Quiet voices drifted from the kitchen. And smells, fried quail, beans, cabbage and pecan pie. Blaze, loafing in the morning sun. Bessie sat on a stool in front of the kitchen sink and GeorgeAnn leaned against the counter, shredding walnuts for the cookies. We stacked luggage in the front room and retired to the porch. Smith claimed a rocking chair, selected a cigar and uncorked a bottle. Way back on my momma’s side we were from the South too, by way of the Nolichucky and Memphis. Now here we were with Wighardt van der Gryp, a professional hunter from the other South – South Africa – and Sam Pyke who grew up south of the Columbia River. Jim Linder, from North Carolina, rolled in a few minutes later. We had driven out of Birmingham hours before and wound our way onto a narrow back road to a town called Hatchechubbee where Don and Maybell Dixon run Dixieland Plantation. If I did the math right, Dixon was 80-years-old or close to it. In the morning he would show us this land he grew up on. Smith was schooled at The Citadel where the cadets still wear the gray they donned in the War of Northern Aggression. In the morning, Don Dixon and the horse handler, Dan Nelson steered us toward the horses we would ride. It has been this way my whole life, whenever a string of horses has one named Bert, that’s the one I end up with. This time, Bert was a strawberry roan. I patted his neck and tightened the stirrups. Before I mounted up, I put my face against his, an old Indian trick, and whispered to him I’d treat him right. 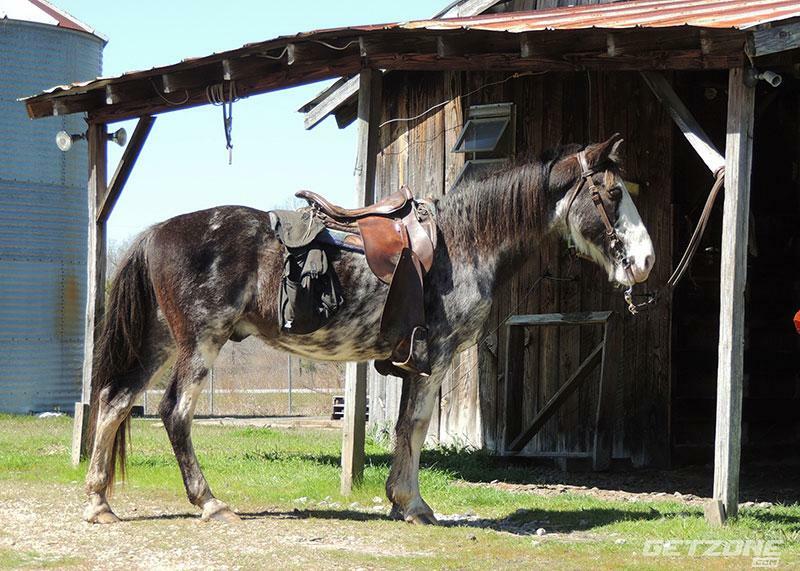 Jim Linder swung up on top of Cuba, a paint, while Wighardt rode Buck, a palomino. Brian Smith chose Red, a chestnut, “I was born for this,” Smith said as shoved an L.C. Smith double gun into the scabbard and turned the plantation horse in a circle. 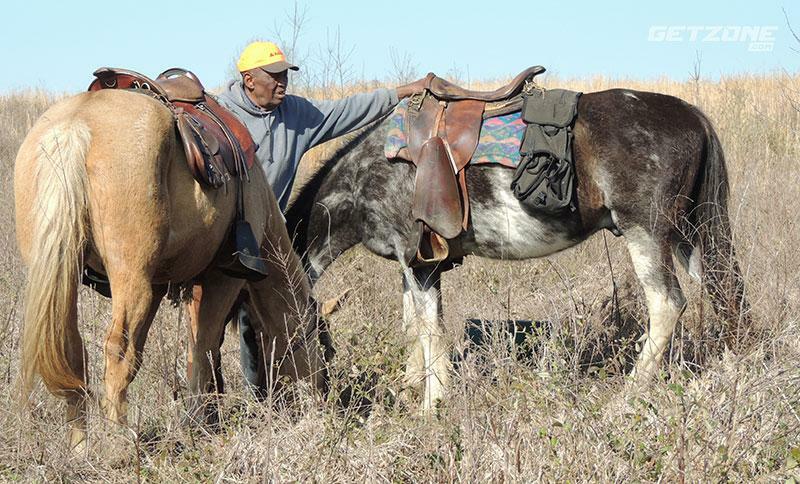 Don Dixon led off astride a white-faced dappled liver chestnut named Blaze. He called him crazy. We rode into the pine trees. Ahead of us, Bob, the nine-year-old English pointer quivered with excitement. As he cut back and forth, I watched the horses. None of them seemed to pay attention to the dog except Blaze, Dixon’s mount. Blaze watched every turn the dog made, out there in the pines, in the wild broom straw, down the open lanes cut for the horses. 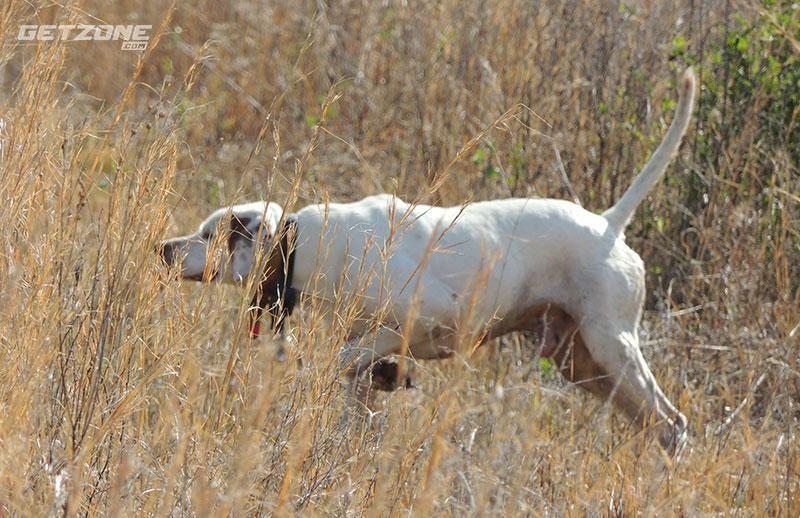 Bob, an English pointer, locked up on a covey of quail in tall grass in eastern Alabama. On a hill planted to knee-high cover allowed to grow wild, Bob’s body language changed. His tail flagged, his muscles tensed and he turned tighter circles — cat-like — to stand, one front leg off the ground, tail at a diagonal, rigid, nose turned into a narrow strip of cover. “Look out, Bob,” Dixon whispered. Bob lifted his chin. The birds were close. Dixon glanced over his shoulder. “Two,” he said, which meant two of us would dismount and load guns. “One on this side and one on that,” he said like he only wanted to tell us once. We walked past the birds first, they had held tight and we didn’t see them. When we turned back, six quail flushed. Dan Nelson keeps track of the horses while the hunters walked up on quail. Focused on two of the quail, I saw one jink wild, while another buzzed a couple of feet off the top of the grass, arcing toward a stand of pines. I shot it and watched it tumble. My brain registered a reddish brown sort of bobwhite-shaped blur and the bead and the trigger and a puff of feathers that drifted on the breeze. I smelled the gunsmoke drifting back. When the dog brought the bird to hand, I recognized it as a Tennessee red. Each time the dog pointed and held tight, Dixon would dismount and that was our signal. He didn’t turn and wait, he expected us there alongside, two steps ahead on either side, close, but not too close to the dog. I shot the Weatherby like I was born to it, taking five quail — four reds and a bobwhite — in the first five shots. We finished the morning with 14 birds between us and returned to the house and the barbecue smells that wafted from the kitchen. Lunch, a nap on the porch, sweet tea in a tall glass and we were revived. Back at the loafing shed, the horses watered and fed waited at the hitching rail. But this was not why we were here. A dog named Annie was on a lead. Our shotguns were in the scabbards again. Dixon had a foot in one stirrup when I stopped him. I wanted to know where he was born and when. “This was my daddy’s place and his daddy’s before him,” Dixon said slow and soft. He was born in the house his grandma was born in. 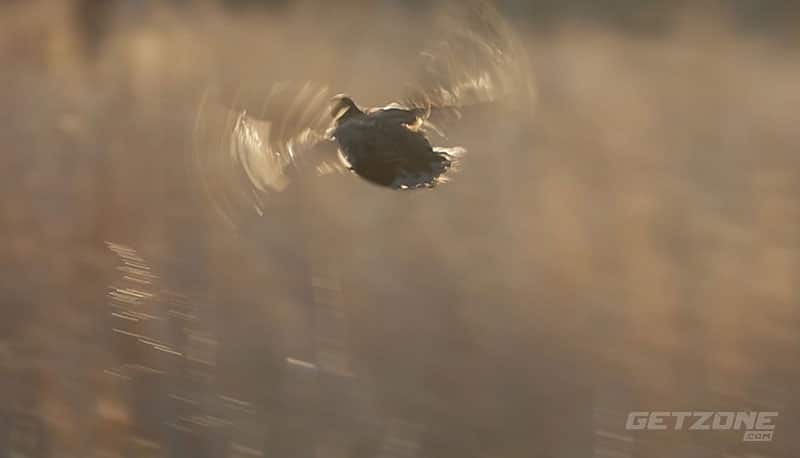 A bobwhite quail in flight is a pretty site and a hard target to hit. I asked the same question of Dan Nelson, who said he was born in Hurtsboro and had worked at the cotton gin for 30 years before he came to work for Dixon — both men born of the Great Depression. In the afternoon, Wighardt began to shoot very well. By trade, he is a professional hunter from South Africa. He makes a living guiding hunters on big game and has often stood at my shoulder. I realized I had never seen him shoot. After I saw him take three quail in two shots from the same covey where I knocked one down, I thought, as good as I was shooting, he was better. That’s the kind of person to have backing you up on a leopard hunt — or on a wounded buffalo. A bobwhite quail taken on a farm near Hatchechubbee, Alabama. 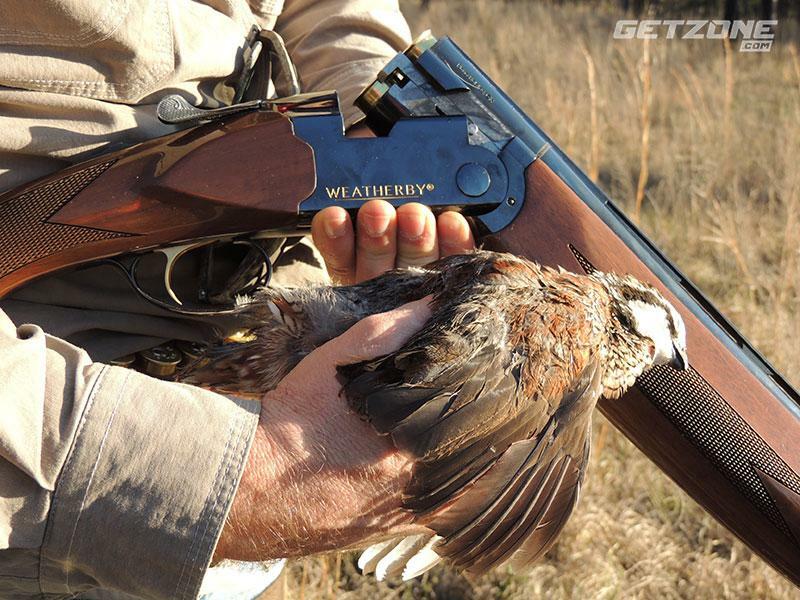 Bobwhites are the quintessential game bird of the South. A day in the saddle gives time to think. I pondered what it was that brought me across the continent, that brought Wighardt from the other side of the globe. 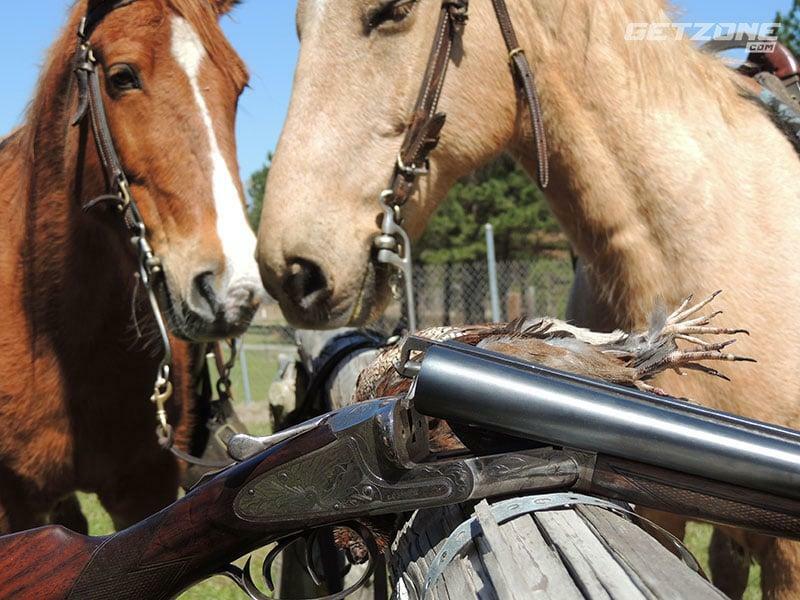 It wasn’t to ride a plantation saddle or to walk up on a pointer named Bob or Della or Annie. We didn’t come for the simple joy of shooting at blurs of red and white among the skinny pines. Though I would hope to return for these things. I wanted to hear the wind, feel the saddle leather creak beneath me and the thump of hooves on the wooden planks over the creek. On the porch when cigar smoke drifted up, lazy against the green of the pines, into the leaden sky; when amber liquid swirled against cubes of ice, it was easy to agree. We were born for this. Plantation horses and an L.C. Smith double gun with a bobwhite quail and a Tennessee Red.